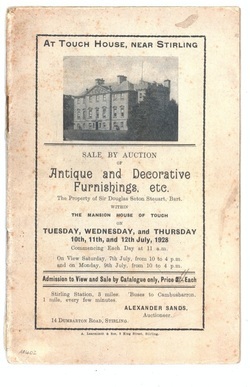 A1402 Catalogue for the sale of the contents of Touch House, near Stirling, July 1928. This catalogue lists the entire contents of the house that were sold by auction after Touch Estate was sold by Sir Douglas Archibald Seton Steuart, Bart. to Charles Alexander Buchanan. The catalogue lists the items for sale room by room – everything from umbrella stands, to the billiard table, to glasses, artworks, Chippendale furniture, napery and a ‘Burmese Bronze Pagoda, with Idol’ were all available for the public to purchase. The sale of the actual mansion house and estate (which pre-dated the auction of contents) is listed in the 1928 Stirling County Sasines, dated 22 May 1928 which details the various parts of the estate sold. of Allanton and Touch papers. The National Records of Scotland and RCAHMS also hold various plans and maps of the estate, some of which can be viewed on www.scotlandsplaces.com online.